Today the archaeology students working at the east end of Tradd Street spent a lot of time sketching and recording the profiles at the western end of the exposed redan. 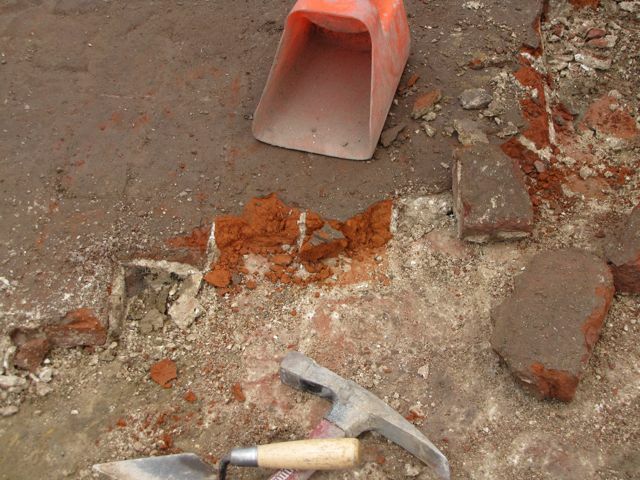 After that careful work was completed, they began digging out more soil and removing the paving bricks from the floor of the Lower Market. 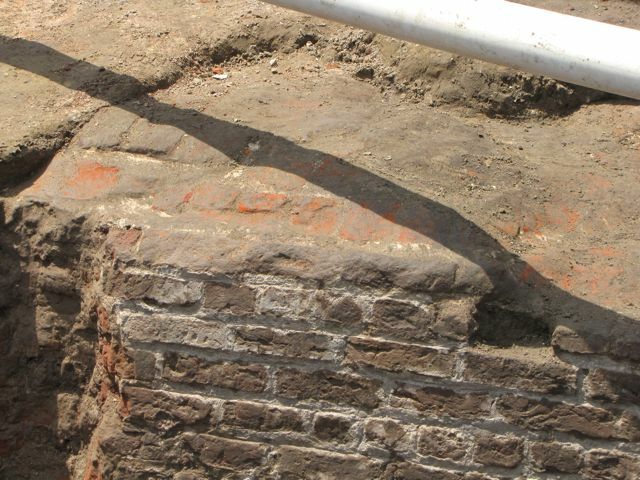 Those thin paving bricks (see the photo below left, were laid in mortar in 1786 over the remnants of the redan, but after more than two hundred years the low-fired clay of the bricks is now softer than the mortar. 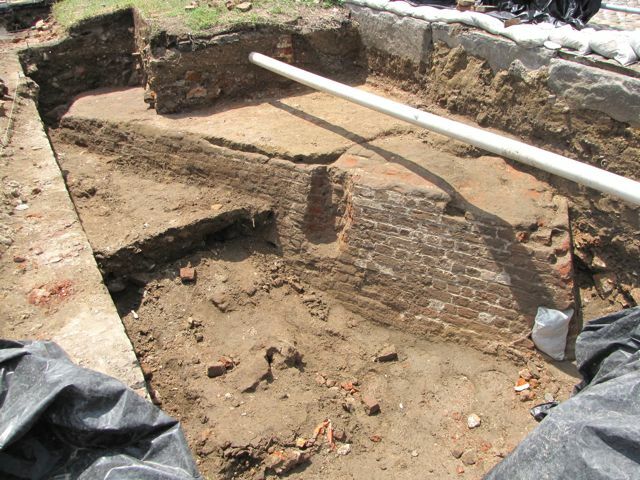 Within a few hours of this messy, tedious work, however, they had removed nearly all of the market floor from the redan, providing a much better view of the colonial fortifications (see images below). Fragments of eighteenth century ceramics, glass, and clay pipes continue to appear in the soil excavated from the redan area, but today Martha showed me something different—a couple of interesting bone fragments. The first is the core of a horn of a short-horned cow. At just over three inches in length, this small item (see photo at left) is an important reminder that the flesh of calves and cattle were routinely brought to the Lower Market at this site during the second half of the eighteenth century. 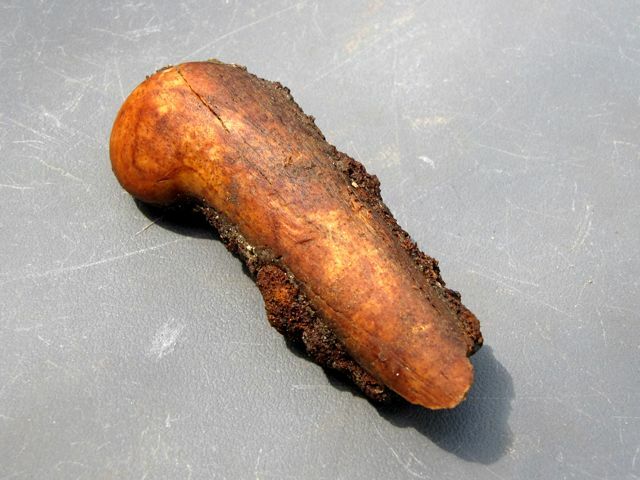 A related cultural artifact was also found today: a small mid-eighteenth-century knife handle carved from a piece of cow bone. 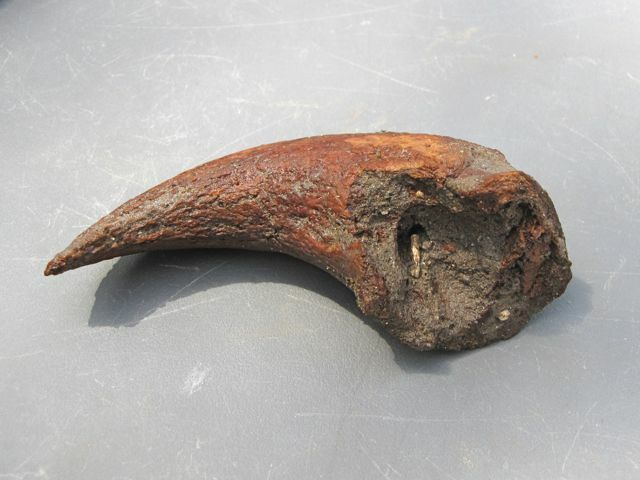 As you can see in the photo at right, the bone handle itself has darkened considerably with age and exposure to the elements, and the remnants of the steel blade have corroded and rusted away. These are wonderful reminders of cultural activity on the waterfront of early Charleston.